Juliana Buhring has just completed a round the world, 18,000* mile solo road, trip in 152 days. Her journey began in Naples on July 23, 2012. She has submitted her accomplishment to the Guinness World Records as the first woman to circumnavigate the the world solo. "From the beginning, everybody told me I wasn’t ready. Without a sponsor or money, without a technical and medical support team, with only eight months of training on a bicycle, I was not ready to leave and should delay the entire endeavour for at least another year. I got a lot of laughs in the early days. Nobody believed I would make it, certainly not all the way around the world, averaging 200 km a day without rest. I was not an athlete and not a cyclist. In fact, there was nothing to qualify me for such a huge undertaking. Nothing but willpower and the determination to finish no matter what. I was out to prove everything is possible. That we can do things that are greater than ourselves. If I had waited for the perfect level of fitness, the perfect cycling techinique and mechanical know-how, the perfect weather conditions, the support, the money, doubtless I would never have left at all. I believe that many people put off making their dreams a reality, waiting for the right time or the right conditions. There is no such thing. The right time is now. ‘One day’ is just another way of saying ‘never’. 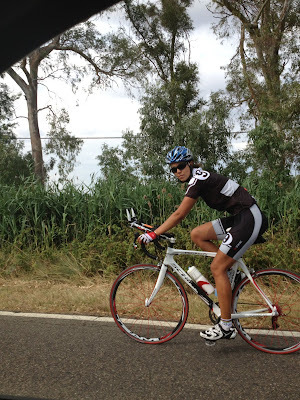 So I hopped on Pegasus, and pedaled out of Naples on July 23rd, 2012. From the get-go, there were problems. My shifter broke and I cycled 2 weeks in either the highest or lowest gear. My iPhone fell, the screen smashed in. The first month involved a lot of adjusting to just being on the road, ironing out all the inevitabile kinks and problems that are impossible to predict. Before I knew it, I’d crossed America. The further I got, the more people began following my endeavour. Soon I was being literally propelled along by an international support team of friends, strangers and well-wishers who kept me going morally and financially and without whom the journey would have been far more difficult and failure a real possibility. Twenty-nine flat tires, gear/shifter problems, 6 broken spokes, broken pedal. There were four serious falls (involving blood and bruises). 70% of the journey was against strong headwinds; between 100 – 160 kmph in New Zealand (No joke, I had to walk, it knocked me over twice and actually lifted Pegasus in the air, bags and all). Crossed 6 mountains, the Australian Nullarbor, got diaharea and throat infection in India, cycled four days through a cyclone, dog attacks in Turkey, magpie attacks in Australia and to finish, -9 degrees and snow upon re-entering Italy. As I’m writing this, I’m just under 400 km from the finish line. It feels like 10,000. Every day is a fight just to keep pedaling. The moment I stop, all I can think of is curling up somewhere and sleeping. It’s hard to believe the journey is almost at an end. Some days it feels like it will never end. Even my dreams involve planning routes and pedaling…endlessly. Pegasus is pretty tired too. We’ve conquered many challenges together. More often than not, I wondered whether I had what it took to see this endeavour through to the end. I guess I have my answer. And I guess too, I’ve proved my point: we can do things that are greater than ourselves. You don’t need to be rich, famous, talented, or anybody at all to do something extraordinary. The sky is NOT the limit. There are no limits, only social, cultural, religious and self-imposed limitations. If we can break through those, I believe humans are capable of going much further both as individuals and as a species." * Travel by sea and air is allowed to achieve 24,900 miles but a minimum of 18,000 miles must be ridden. Pistard with Cinelli: "Wear Your Way"